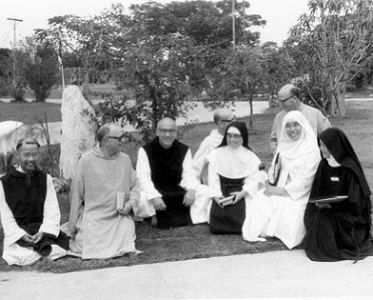 Father Louis, as Thomas Merton was known to his fellow monks, lived his last years as a hermit in the woods near his Cistercian abbey. His hermitage was small and unadorned, a cinder-block building with cement floors. He cut his own wood for the fireplace, hauled water from the abbey, cooked on a Coleman stove, and read by kerosene lamp. Eventually, as his health deteriorated, electricity was installed. Typically, he arose at 3:15 a.m. to begin the prayers of the day. He was perhaps the first Trappist hermit of the modern era. He was surely a monk whose living and passing brimmed with irony. Vowed to silence, he was known around the world for his words. Cloistered with his brothers in Kentucky for twenty-seven years, he died half a world away in Bangkok, alone. An eloquent critic of the war in Southeast Asia, his body was flown home in the bay of a U.S. Air Force jet from Vietnam.